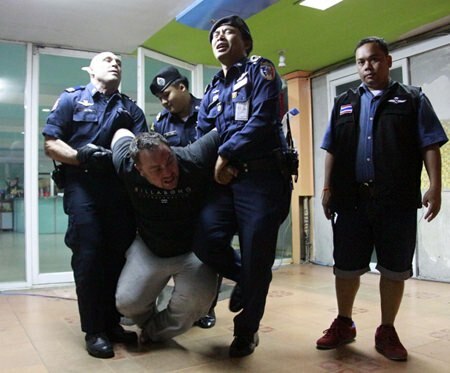 A city hall municipal officer was assaulted by a drunk Scottish tourist on Walking Street after the officer intervened allegedly to stop the Scot from harassing tourists. Darren James Raymond, 38, was wrestled to the ground after about 10 minutes in the early hours of Feb. 11 outside the 808 disco. He was unresponsive to police questions, as was his drunk Thai girlfriend. Tongchai Kerdsanong, 37, said he received a punch in the eye after he tried to prevent the inebriated Scotsman from haranguing passersby on Walking Street. Darren James Raymond is brought in to the station to sleep it off, and eventually face charges of punching a city hall municipal officer on Walking Street.